How do I make a Long Answer question? Long answer questions enable your students to demonstrate their understanding of topics in great detail. They can be self-marked against a model answer, or marked by you as the teacher. 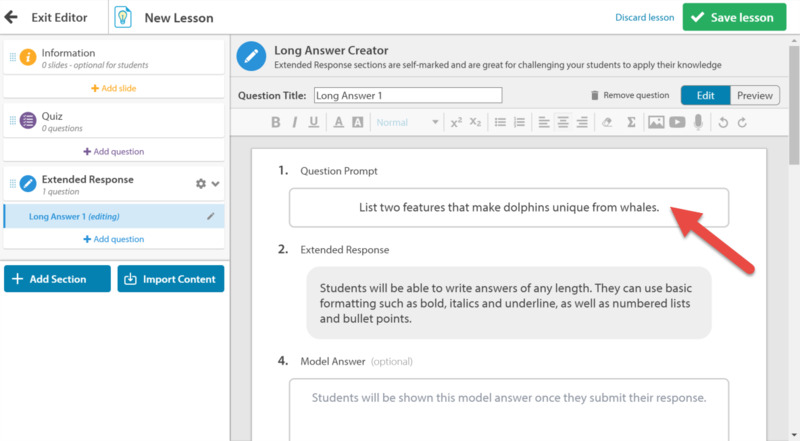 Long answer questions can be created in Extended Response sections of a Smart Lesson. Including them in other section types may not work correctly. 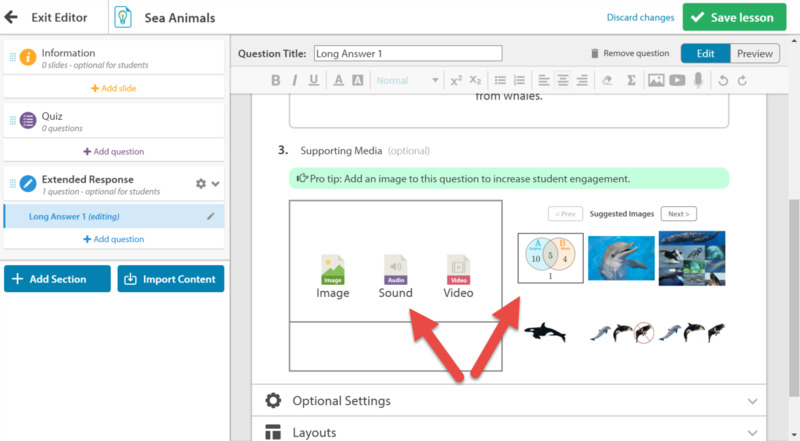 For more information, see Which question types can I use in each Smart Lesson section? 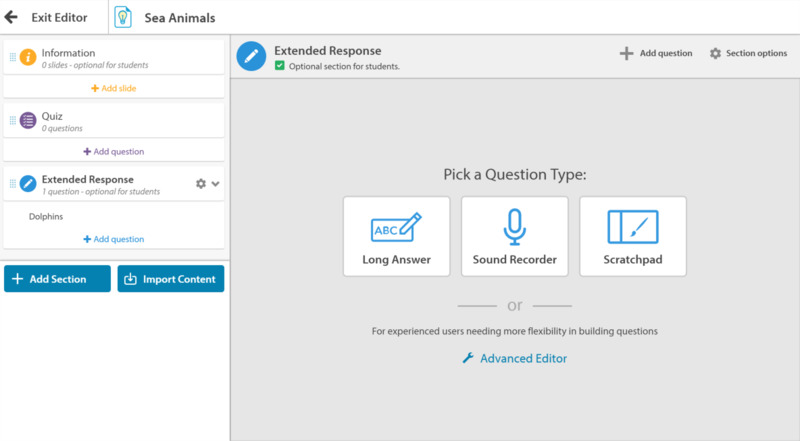 Check your students' responses to long answer questions from the Control Panel. 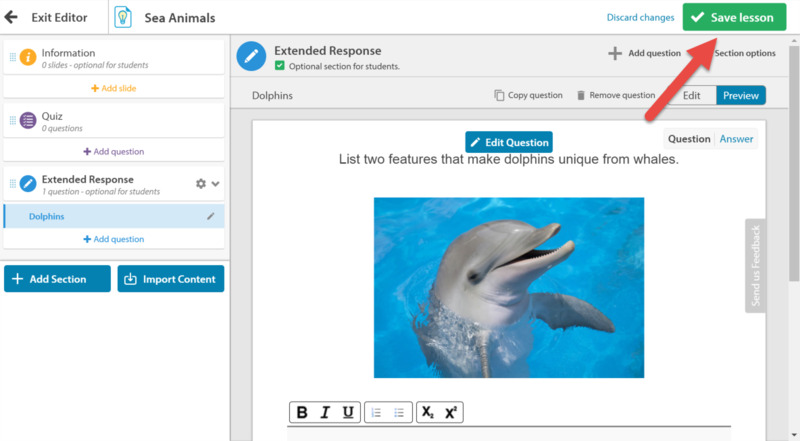 For more information, see How do I give my students feedback on their extended responses? 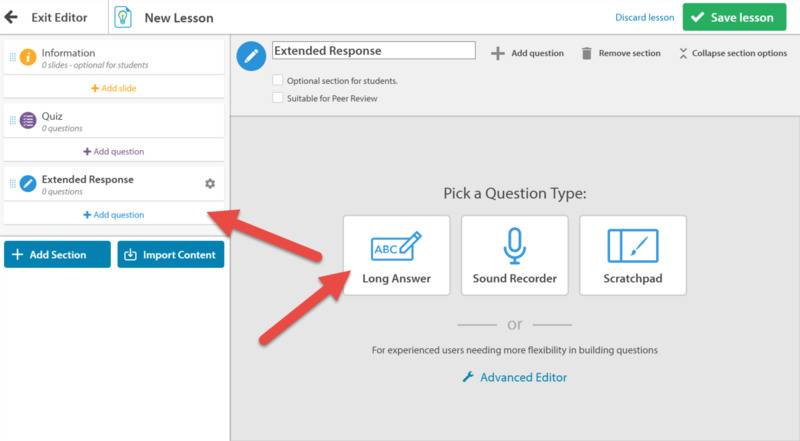 Select an existing Extended Response section, or add a new Extended Response section to your Smart Lesson, then select Long Answer as your question type. Type your question into the Question Prompt box. This question can be as open-ended as you like. Type the answer you'd expect your students to give into the Model Answer box. When students submit their answer, they will be shown the model answer against which they can compare their response. Students will be able to mark their own work against this model answer, so if they write something different that they feel is a valid answer, they can still mark themselves as correct. This prevents students from becoming frustrated when they're marked wrong for something that is phrased differently to your example. As you type your question prompt, images which may be relevant will appear under Supporting Media. Click any one of these to add it to your question. Alternatively, click on either Image, Sound or Video to search our full media galleries or upload your own piece of media. For more information on finding or uploading media, see How do I add media to my question? 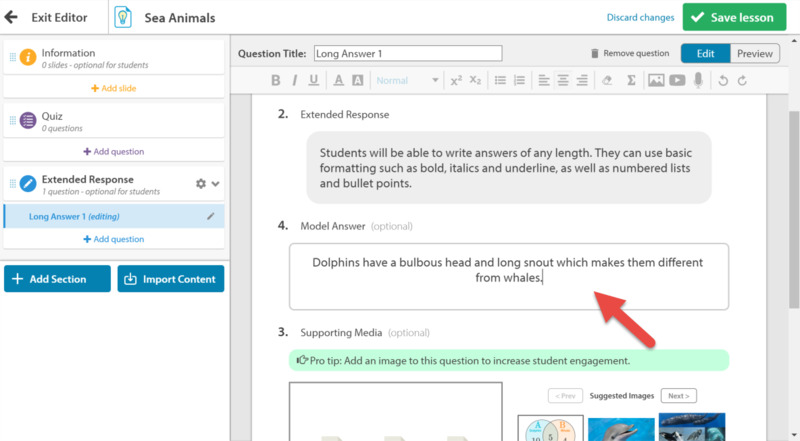 When students submit their response, you can provide additional information on top of the model answer. For example, you could explain statements from the model answer in more detail. Click Optional Settings and type these additional details into the Automatic feedback for wrong answers box. 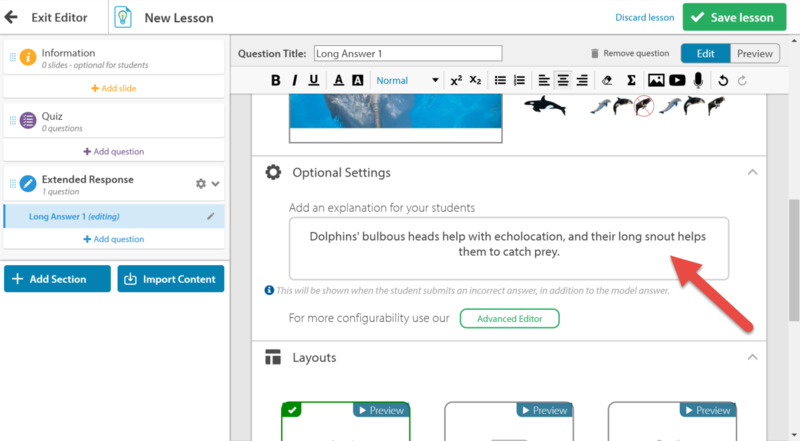 Education Perfect also has an Advanced Editor for experienced users of the system to customise questions further. We strongly recommend contacting us on support@educationperfect.com before starting to use the Advanced Editor, as it is considerably less user-friendly. Questions created in the Advanced Editor without proper training may not work as intended. Expand Layouts and click any of the different styles to change where your question text, answer box, and media will be displayed. 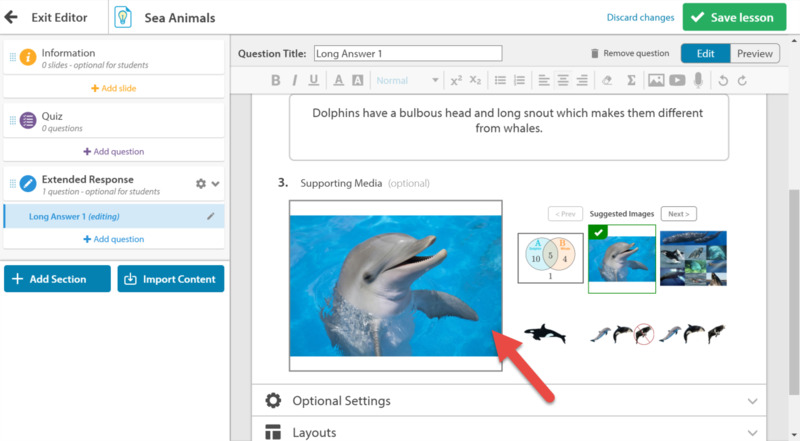 See how the question looks in each layout by clicking Preview after selecting a different style. When you're happy with your changes, rename the question by clicking the question title Long Answer 1. Click Save Lesson when you're finished making changes. Add another question by selecting the Add Question option and repeating the above process. How do I create a question that uses the sound recorder? How do I make a multichoice question? How do I add media to my question? How do I make an information slide? How do I add analysis tags to an assessment? How do I include Peer Review when Building Lessons?